1. MOSUL - British Museum training Iraqi experts to save Mosul heritage. One of the world's leading institutions for the study of ancient Iraq, the London museum has been training Iraqi experts for the past year in high-tech methods to preserve and document their history. "Once the city is liberated, there will be an enormous plan of reconstruction of the Museum of Mosul," Sebastien Rey, a lead archaeologist from the Iraq Emergency Heritage Management Training Scheme, told AFP. "One of the participants of our scheme will be the first archaeologist to enter the museum and do an assessment of the destruction inside." The programme is designed to "get people ready for the day" archaeological sites are taken back from IS control, said its director, Jonathan Tubb. "We wanted to do something positive and constructive in the face of the most appalling destruction that had been going on." 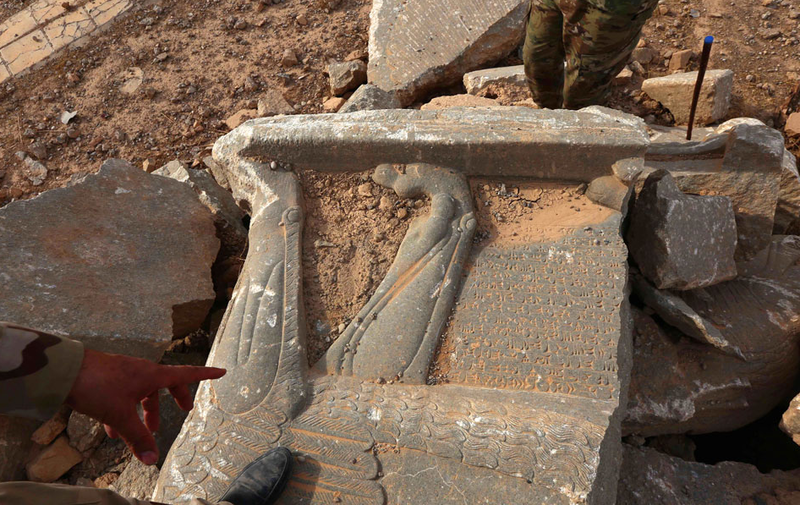 Islamist militants in Iraq, Syria and Mali have targeted priceless cultural heritage sites after denouncing them as un-Islamic. The Mosul area, home to several archaeological sites including the ancient cities of Nineveh and Nimrud, is of particular importance. In April 2015, the IS group released a video of its fighters destroying monuments in Nimrud before planting explosives around a site and blowing it up. Statues in Mosul's museum were also attacked, as was Hatra, a Roman-era site in Nineveh province. The Iraqi army launched a massive operation in October to retake Mosul, Iraq's second city and the IS group's last major stronghold in the country. After recapturing the city's eastern flank, special forces are now fighting their way through the west in an offensive that began on Sunday. Launched in January 2016, the British Museum's six-month training scheme sees Iraqi archaeologists spend three months in London and three months in Iraq. It includes training in the use of satellite imagery and digital mapping, as well as tools for documenting buildings and monuments. The archaeologists then practise their new skills in secure sites across their home country, which has led to new discoveries. In Darband-i Rania, located in Kurdistan, in northern Iraq, the new excavations unveiled a previously unknown fortified city. "We found a city from the Parthian period, that’s roughly the time of Christ," John MacGinnis, a senior archaeologist from the British Museum explained. In the ancient Sumerian city of Girsu, or Tello, in southern Iraq, massive mud-brick walls belonging to a temple constructed in the third millennium BC, were discovered. Tello has also proved useful for training because it is huge at around 250 hectares and has a very similar topographical layout to sites closer to Mosul. The museum has long called for Britain to ratify an international convention to protect cultural artifacts in war zones, a measure that is currently making its way through parliament in London. In 2003, it raised the alarm on looting of major Iraqi museums and led a taskforce to the country in response to damage inflicted on cultural sites by the conflicts in the region. A graduate of the British Museum scheme, which aims to train 50 archaeologists over a five-year period, is now leading the assessment in Nimrud. And Halkawt Qadir Omer, a current trainee from Arbil told AFP: "The training is very useful and beneficial for us and we can use the tools that we get here." Known as the cradle of civilisation, Iraq is still full of undiscovered treasures. For Omer, the scheme offers much more than simple tools: "Now, we have contact with the British Museum to complete our projects, to discover and to change the direction of history and archaeology." 2. PALMYRA - ISIS Back in Palmyra. Amphitheater Blasted. Tetrapylon Destroyed. Assad and Putin Blame US. Back in Palmyra. Amphitheater Blasted. Tetrapylon Destroyed. Assad and Putin Blame US. January 22, 2017. 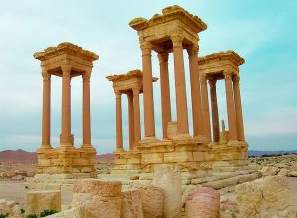 In March 2016, Bashar al-Assad and Vladimir Putin boasted of driving out ISIS and recovering the ancient World Heritage site and modern city of Palmyra. In Assad’s case, taking Palmyra from ISIS resulted in his first positive international press in decades. After Russian and Syrian government forces took the ancient site, they organized a veritable media feast celebrating their role as saviors of culture. In May, dozens of members of the world press and UNESCO officials were flown to a performance in Palmyra’s ancient amphitheater led by conductor Valery Gergiev with the St. Petersburg Mariinsky Theater orchestra. Russian President Putin introduced the program by video, contrasting the civilization represented by the presence of the orchestra with the violence and barbarism of ISIS. As a violinist played Bach, Russian television interspersed various shots of Putin, along with images of murdered 81-year-old Syrian archaeologist Khaled al-Asaad, Russian soldiers who had died in the conflict, pretty Palmyran children holding bouquets, and bombed out Syrian cities. By the fall of 2016, however, the Syrian regime and Russia had abandoned Palmyra’s site and its citizens and moved their forces on to attack Aleppo. Virtually ignored by the Syrian government, which was busy destroying Allepo’s ancient sites along with the modern city, Palmyra was recaptured by ISIS in mid-December 2016. One of ISIS’ first steps was to demonstrate its contempt for the regime and for history by adding to its list of destroyed Syrian ancient monuments. On January 20, 2017, the world press reported that aerial photographs showed that the rear façade of the world-famous Palmyra amphitheater has been blown up. The Tetrapylon, another of Palmyra’s most famous monuments, has also been destroyed. Palmyran city council official Omar Albenia told CNN: “We at the council of Palmyra and Badia condemn this cowardly terrorist attack carried out by ISIS and also place the blame of the Syrian regime of what is happening in Palmyra when the city of Palmyra has exchanged hands between ISIS and the Syrian regime several times.” Albenia also stated that 11 civilians had been executed by ISIS. Putin and Assad, however, blame the US entirely for the retaking of Palmyra and its continuing destruction. No US official has responded to these patently false propaganda claims. Update: It appears that Palmyra may soon change hands again. News outlets AMN and Sputnik claimed as of January 27, 2017 that pro-government forces were “highly active” in the Palmyran combat zone and intent on recapturing the region. For important reporting on the destruction in Syria and access to aerial images of the recent destruction, visit the ASOR Cultural Heritage Initiative, Special Report: Update on the Situation in Palmyra. According to Abdulhadi Najjar: “The Tetrapylon consists of a square platform bearing at each corner a tight grouping of four columns. Each of the four groups of pillars supports 150,000kg of solid cornice. A pedestal at the centre of each quartet originally carried a statue. Only one of the 16 pillars is of the original pink granite … the rest are a result of some rather hasty reconstruction carried out from the 1960s onwards by the Syrian Antiquities Department.